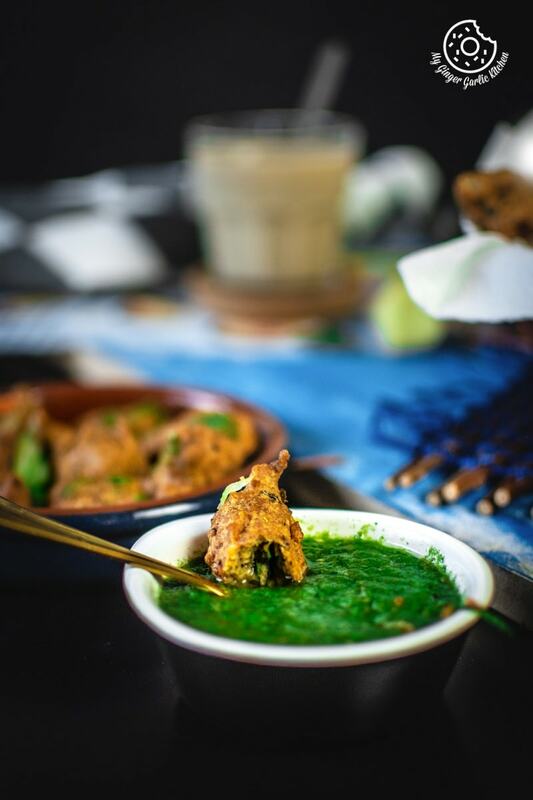 Paush vada is a very popular dish originating from the pink city of Jaipur. These are deep fried fritters, mostly consumed during winters. This winter snack Paush Bade (posh bada) is made with the combination of yellow lentils and black-eyed beans. Poush vada is specially made and savored during the cold months of December and January because of its anti-cold properties. These Paush vadas are served hot with Paush Khicha/Khichdi. Paush (पौष), Posh or Pausha is a month of the Hindu lunar calendar in the Indian national calendar. This is the tenth month of the year, parallel to the months of December/January in the Gregorian calendar. Pausha is famous as Paush, or Poush Maas (month), which begins with the full new moon in the month of December which is the ninth month of the year. Rajasthan is the land of Kings and Queens, and Jaipur being the capital of this kingly state, has been following all the traditions since the times of royals. Since old times, it has been a tradition of organizing and celebrating ‘Paush Bada Utsav’ in Jaipur. 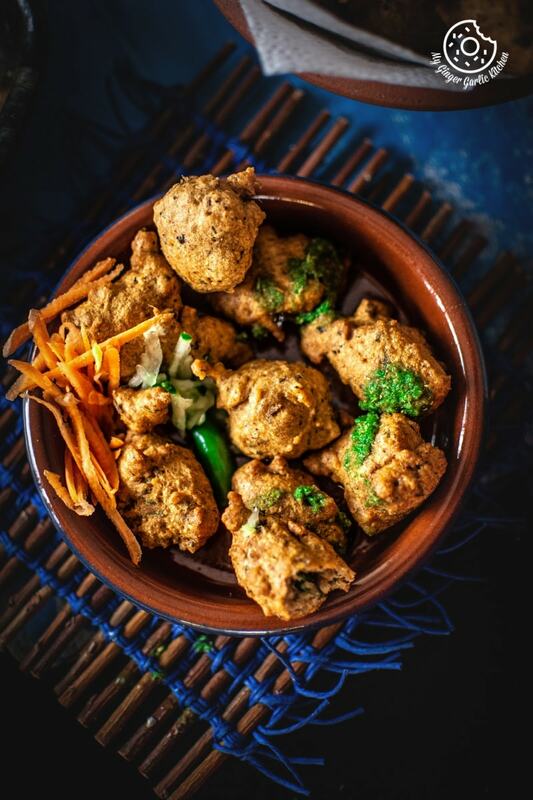 Back in those times, all the religious people would gather at local temples and sang devotional songs (bhajans), and celebrated Paush Bada Utsavs in temples where Gods were offered Paush Bade (Lobia and Moong Dal Pakode/Pakodi), aka fritters. This prasad was always served along with a sweet dish, which usually is Aate Ka Halwa or Suji Ka Halwa. 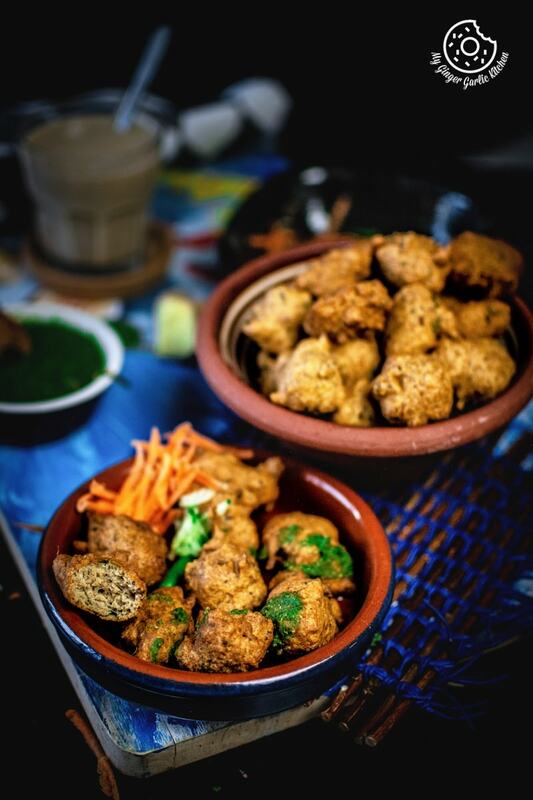 These posh vadas are spicy fried dal pakoras/bhajias aka fritters. 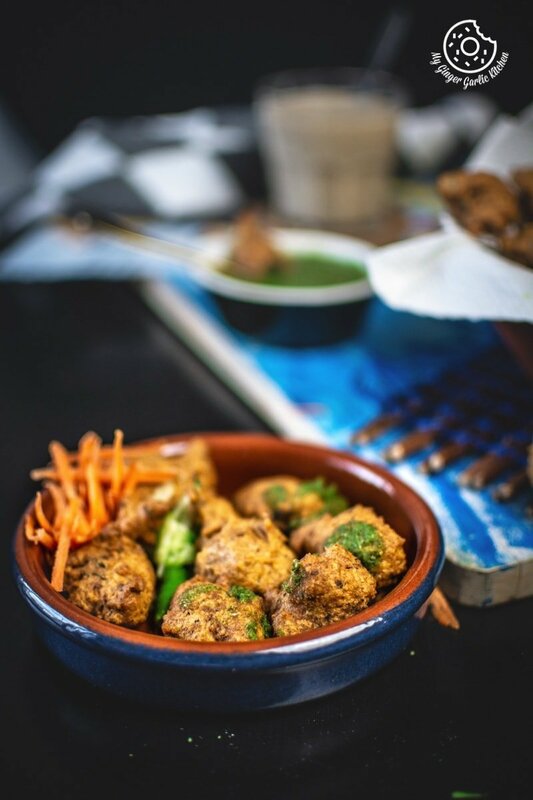 The batter of paush vadas is prepared with soaked lentils and beans paste. Consuming Paush bada during winter helps fighting cold because it is made from various hot Indian spices, such as peppercorns (kali mirch), cloves (laung), cumin seeds (jeera), coriander seeds (sabut dhania), fennel seeds (saunf) and garam masala powder. This snack is so admired by Jaipurites, that they are also easily available at the roadside stalls. This old tradition is still alive in the hearts of Jaipurites and thus this ritual is still practiced with the same enthusiasm and devotion. Many of you know that Jaipur is my native place, so I grew up watching all these Paush Bada Utsavs. Paush month is so auspicious and the snack ‘Paush Vada’ itself is treated as a festival in Jaipur. Paush Vada is one one of the biggest sacred festivals which is also known as Paush Bada Mahotsav, and the satvik snack is known as Paush Bada Prashadi/Prasad (a gracious and holy offering to the deity with a devotion). In Jaipur, the time of December/January means to celebrate the traditional festival food called Paush Bada or Paush Vada. This is an authentic, quintessential and traditional snack which helps to fight cold in the months of winter. Paush month (December/January) is the time of chilly winters in northern Indian states, and thus enjoying this warming snack is a tradition. Donation is collected from devotees for this religious festival Paush Bada. This festival is always organized at temples and other holy places where devotees can prepare the prasad by themselves. Posh vadas are offered as a bhog (offering) to Gods in all the Hindu temples and then the prashad is distributed among all the devotees. There are so many temples in Jaipur. So during the Paush month, every single day there is a Paush Bada Utsav somewhere in Jaipur. Almost at every place the prasadi is free for everyone. However, there are some places where you buy the tickets prior to paush bada, which works as the donation for the festival, and people can only have prasad after buying tickets. How do you make Paush Vada/ Posh Bada at home? 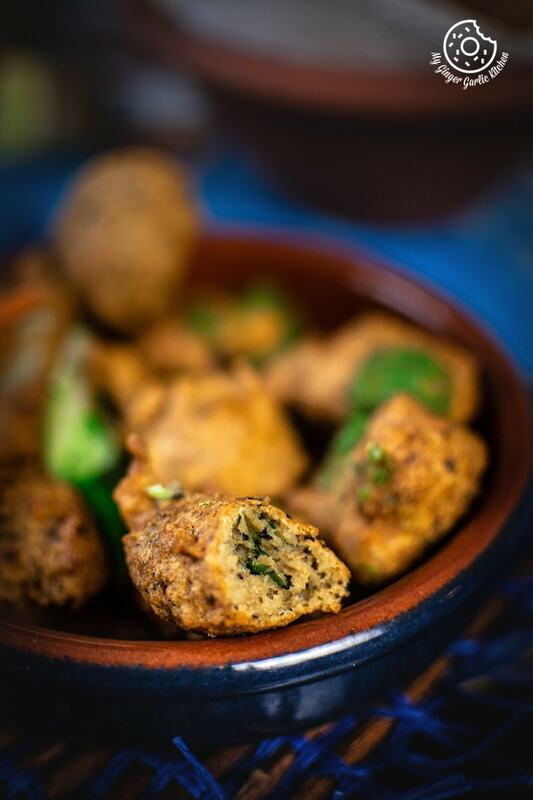 Traditionally these posh vadas are made with the equal part of green or yellow moong daal, chawli beans/lobia (black-eyed beans). The lentils are rinsed and soaked overnight. Then they are washed again and blended into a smooth paste along with green chilies and ginger. Some people like to ground it coarsely for that extra lentil-like texture. This mixture is whisked well until light and fluffy. After that, crushed whole spices and powdered spices are added to the batter. These whole spices which are warm in nature, provide the warmth to the body which is required in cold weather. Lastly, chopped coriander leaves are added to the batter. Finally, this batter is dropped into the hot oil and deep fried until crisp and golden. How to serve Paush Vada? Paush Vadas can be served along with a simple green chutney. But for prashad, devotees worship Gods, and after worshiping, the whole prasad feasts is offered to Gods and then it is distributed to the general public. The whole prasad meal includes Paush Bade served with Puri, Aloo Ki Sabzi, Green Coriander Chutney, Halwa and Paush Khichda. You can also add some freshly chopped green fenugreek leaves or spinach leaves to the vada batter. These greens increase the nutritional value and add a nice crunch to these vadas. These vadas are offered to Gods, that’s why no onion garlic is used in this recipe. But if you want, you can add some chopped onions to the vada batter. 1:1 beans and lentils ratio is used for vada recipe. But you can also increase the amount of moong dal. Whisking the batter is very important because this ensures that your vada would come out airy and fluffy, so don’t skip it. No baking soda is needed for this vada recipe. Only whisking would do the magic. My vadas taste hot, but not too hot. The original taste of these vadas is a lot of spicier. If you want them to taste hotter, then feel free to increase the number of cloves, peppercorns, and green chilies. I have soaked moong dal for overnight, but soaking dal for 3-4 hours in enough. The ideal temperature for frying paush vada is medium heat. Always fry vadas at medium-low heat. If you deep-fry them on high heat they will turn crisp from outside but they will not cook from inside. If you deep-fry them on low heat, then the vadas would absorb so much oil, and won’t taste good. 1. Rinse well dhuli moong dal (split yellow lentils) and lobia (black-eyed beans). 2. Soak them separately for 6-8 hours or overnight. 3. Drain water and rinse well again. 4. Add dhuli moong dal and lobia to a grinder jar along with green chilies and ginger. 5. Grind to make a thick and smooth paste. Scrape off the sides once or twice for a smooth blending. Add 1-2 tbsp water if needed. (You can also keep it coarse if you want). 6. Transfer lentils paste to a wide mixing bowl. 7. Whisk it well until batter is light and fluffy. This step is very important. 8. Add asafoetida(hing), red chili powder(lal mirch powder), garam masala powder, roughly crushed cloves (laung), roughly crushed peppercorns (kali mirch),fennel seeds (Saunf),cumin seeds (jeera) and roughly crushed coriander seeds (sabut dhaniya), salt (namak), and chopped coriander leaves (hara dhaniya). 9. Mix everything well. Vada batter is ready. 1. Heat enough oil in a deep pan over medium heat. To check if the oil is hot, pour a drop of batter in the oil. The oil is ready if the batter sizzles and float at the surface, but it should not change its color immediately. 3. Using a wet spoon or wet fingers, slowly one by one drop the batter in the pan. 4. Make just enough vadas to fill the pan, do not overcrowd the pan. 5. Let them fry on medium heat, and deep-fry from both the sides till they become golden brown and crisp. 6. Drain on an absorbent paper napkin to remove the excess oil. 7. Serve hot crisp posh vadas with coriander chutney. 1. You can also add some freshly chopped green fenugreek leaves or spinach leaves to the vada batter. These greens increase the nutritional value and add a nice crunch to these vadas.